Another remarkable chain of galaxies, Hickson 56 in Ursa Major, is situated just 7' south of the barred spiral NGC 3718. This compact group has several catalogue designations including UGC 6527, VV 150, Markarian 176 and Arp 322. 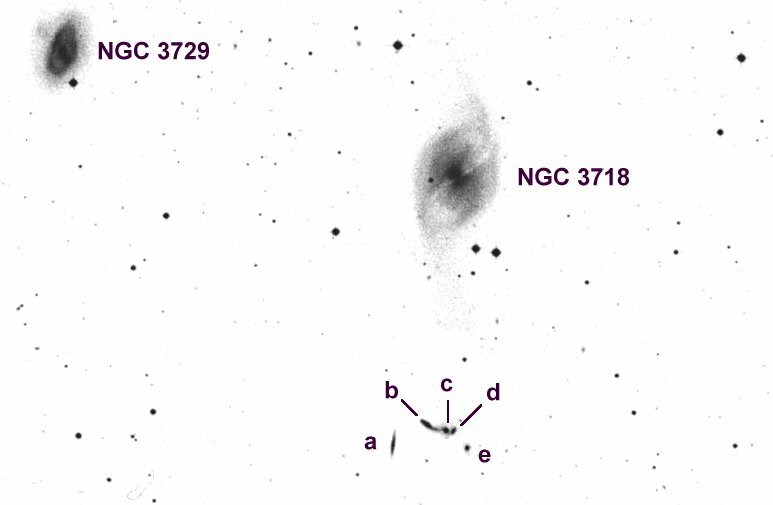 The UGC notes describe Hickson 56 as "a nonlinear chain of 4 galaxies." These four are connected and cover a length of 90" = 48kpc. The fifth galaxy is about 65" from the nearest member of the chain and is possibly at the same distance." Photographs reveal all five members with the central trio appearing as a linked chain, but visually splitting apart the members will challenge experienced deep-sky aficionados.